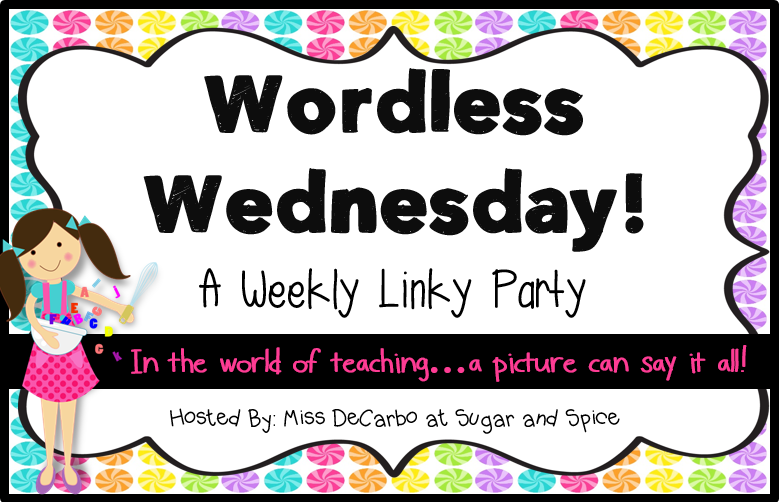 It's Wordless Wednesday and I'm happy to be linking up with Miss DeCarbo at Sugar and Spice! Monday was my first day back after spring break. I took this picture and posted it on Instagram with the caption, "The calm before the storm." It was actually a good day! We now officially have 22 1/2 days of school left. We only have 4 Mondays left! My favorite way to count down the days is by counting Mondays. Don't get me wrong. I love teaching. I love love LOVE my class. I love my job. But, hey... I love summer! So, I want to know... How many days of school do you have left? What is your favorite way to count down? I'm so jealous! I don't even know when my last day of school is yet because we have had so many snow days :( I can't wait to begin "x"ing my calendar off to show the remaining time left. Oh no :( I'm so sorry about all those snow days you have to make up. We got lucky and have some snow days built in. We used the EXACT amount that we have, so we got very lucky! 28 1/2 days left! :) We have a "Today is wonderful because _____" sign that we do each morning during calendar math. It is laminated and the child in charge of the calendar that day writes on it. As we get closer to the end of the year, we will countdown by writing on that sign. Oh my gosh you are so close to summer!! Here in New Zealand we are just starting winter :( It's a long cold wait until summer rolls round again!! Oh my! I'm so sorry :( I am definitely so over all the cold! Now we have the typical spring weather. It's very rainy and stormy here today!! We are somewhere in the 20s. I feel overwhelmed with all the testing that has to be done at the end of the year when I count down, so I usually don't start until around 10. Many around me are already counting down though. Can you share what you used to create your mailboxes? I just blogged about my mailboxes :) Lots of people have asked me and I actually said before I would blog about it and then I never did! I understand feeling overwhelmed with testing. We are in full end of year testing mode! Ick. I don't have a countdown yet. I get out on June 17th. During June I only put the school days on the calendar and as we finish a day it disappears.